We No Sooner. . . I chose my declaration of war to be inflicted upon Judgment. I find in life no matter who you are, what you do and look like, there will be always be preconceived notions thrust upon you before you are able to prove yourself otherwise. This includes judgment that comes after one is in a state of vulnerability and shares something confided or one who lives throughout life without apologies. There are so many factors in one’s life that are controlled by the media and other outside forces of what "their" perception of correct, good, cool and accepted should be. Unfortunately, in many instances those outside forces are not true and have no idea what it is to walk in someone else's shoes, which leads those forces and others to judge. Whether it be in lieu of their own insecurities or for the simple idea that they just can; it is no one's place to judge another person. So many issues and wars throughout time that have been due to misunderstandings either preceded or were followed by judgment. This personal war is universal. 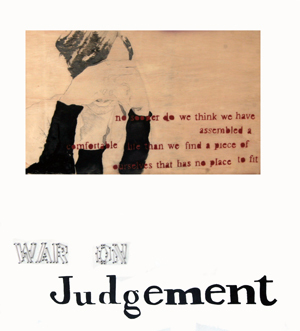 Everyone at one time or another feels unwarranted judgment.